Preheat your skillet or griddle over medium heat. You want the pan hot when you're ready to start cooking your pancakes. Mash your bananas and set them aside for a moment. I use a ziplock baggie so I can mash them up with my hands without a mess. It's faster and requires no extra dishes. Done and done. In a medium sized mixing bowl whisk your two eggs. Add the mashed bananas and almond butter. Seriously crunchy is the best, but use creamy if you must. Stir the ingredients until everything is combined. Pour the batter into your hot skillet and let them cook. You'll know your pancakes are ready to flip when they start to bubble just a bit. Flip your pancakes and let them finish cooking. Place your finished pancakes on a plate in the oven to keep them warm while you make the rest of your pancakes. Gather your favorite toppings (mine are currently cashew butter and honey). 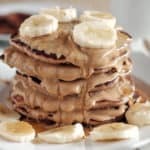 Pull the finished pancakes out of the oven when they're all done and enjoy these simple, yet super satisfying paleo banana pancakes!